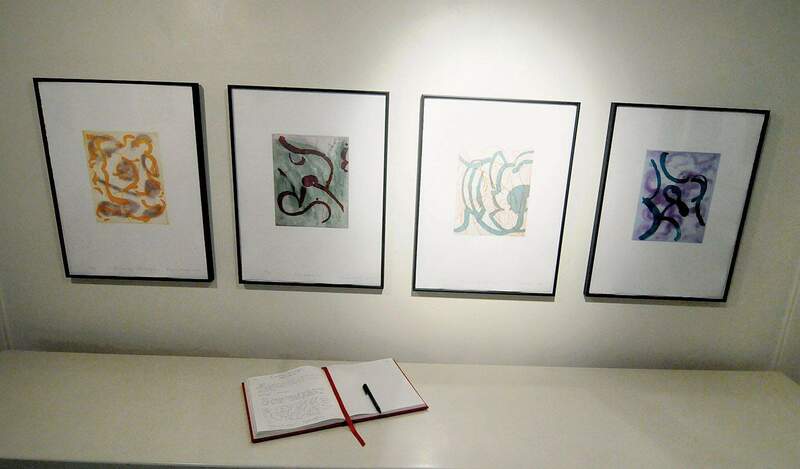 Migratory Flight, and Flight of Red Window, two of Kumi Korfs intaglio prints in her exhibit Inspiration Drawn From Nature in the Art Library at the Durango Arts Center. A row of framed prints fill a low wall in Kumi Korfs Inspiration Drawn From Nature in the Art Library at the Durango Arts Center. This summer the Durango Arts Center Library may be the coolest, most calming space in town. 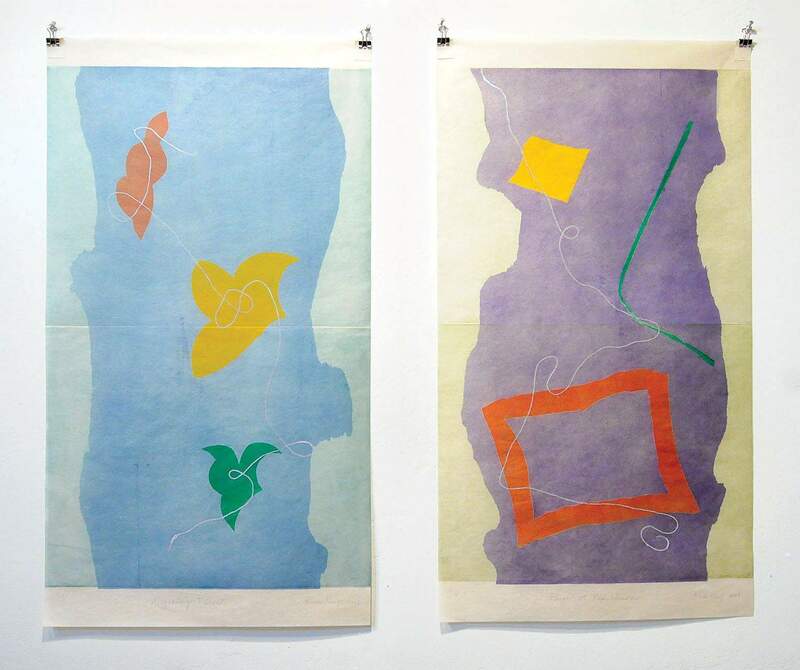 Contemporary prints by Japanese-American artist Kumi Korf are on display. With airy abstract references to clouds and water, plants and birds, these delicate prints invite deep breathing. Images Drawn from Nature marks a return for Korf. A decade ago she gave a DAC workshop and show. Shes a colleague of Mary Ellen Long, one of the Friends of the Art Library who organized this exhibit. Born in Tokyo, Korf earned a degree in architecture from Tokyo University before immigrating to the United States. She received a master of fine arts degree from Cornell University in 1977 and continues to live in Ithaca, N.Y. With her combined degrees as an educational base, Korf has developed an international reputation for her prints, artists books and her workshops. Korfs most current work is on display at the Durango Arts Center: seven diptychs, pairs of her images, line the walls. An eight-section grid titled Wild, Wild Flowers hangs as a large vertical work at the base of the stairs. Four small intaglio prints are the only framed works in the show, and two structural artists books rest on stands. Its not a huge exhibit, but it is of a piece, a quiet, contemplative whole. This is a beautiful effervescent world. So delicate are the colors, so luminous the ground on which layers float, if you sneeze, everything might blow away. And then there is Korfs contracting boldness  big, forceful brushstrokes, the odd mysterious shapes hovering in corners, or crisp cut abstract birds. Its the combination of all these things that gives Korfs universe its blend of the East-West streams that flow through her whole life. Fundamentally an abstract artist, Korf grounds every stroke and color choice in two rivers: the ancient tradition of Japanese art and American Modernism. When Korf puts two very different panels side by side, shes looking for fresh insights. These unusual juxtapositions and the grid format make her every bit of the contemporary artist she is. Its a remarkable alchemy made more potent by Korfs sense of color and her extraordinary luminosity. That is not a key that will unlock a door into this particular world. Anything, about the choice of imagery, the printing process itself, and the decision to work in a small format and create varying grids would offer a path to Korfs aesthetic door. In terms of context, the merger of the European and Asian aesthetics has a deep history of which Korf is a current exponent. In the late 19th century, a craze for everything Japanese surfaced in Paris, London and Rome. At the turn of the last century, Japonisme jumped across the Atlantic and profoundly affected American art. Arthur Wesley Dow championed the Asian aesthetic in his own work and his influential teaching at Columbia University in New York. Artists of various stripes incorporated Japanese principles of design and color right down to our local saint, Georgia OKeeffe, who studied with Dow. Young American modernists penetrated simple subject matter to discover underlying abstract design and lingered there. Today, Korf continues that narrative as an Asian-American artist. So much for the importance of context. On the plus side, Korfs titles are excellent, but still, a few technical notes would illuminate how her work evolves. This may sound like griping, but artists statements are important and many gallery goers appreciate an assist, especially if the work is as abstract as Korfs. A new, short documentary was shown at the workshop and will be repeated at the Durango Arts Center. That may shed some light on Korfs philosophy, working methods and preferences. Until a screening is announced, see the exhibition. Inspiration Drawn From Nature, intaglio prints by Kumi Korf, through Sept. 3 in the Art Library at the Durango Arts Center, 802 East Second Ave. Hours are 10 a.m.-5 p.m. Tuesday through Saturday. For more information, call 259-5305 or email durangocolor@yahoo.com.